The Alfa Romeo 4C, shown in this rendering, most likely will debut at the Detroit auto show in January and could be shipped to U.S. dealers sometime next year. It has a lightweight body of carbon fiber-reinforced plastic. TURIN -- The timing of Alfa Romeo's return to the United States is up in the air again. On Oct. 30, Fiat-Chrysler CEO Sergio Marchionne is scheduled to unveil a new timetable for Alfa Romeo's upcoming models and international expansion plans. Meanwhile, the Italian press continues to speculate that Fiat S.p.A. will sell Alfa to Volkswagen AG. Two years ago, Ferdinand Piech, chairman of VW's supervisory board, said that the German automaker was interested in Alfa, but he was in no hurry to strike the deal. Fiat has reiterated that Alfa is not for sale, and in May the Italian company signed a memorandum of understanding with Mazda Motor Corp. to jointly develop and produce a new Alfa roadster. A year ago, Marchionne promised that Alfa Romeo would return to the United States late this year with a few units of the 4C limited-edition coupe. Alfa's full return was slated for mid-2013 with a compact crossover. A crucial mid-sized sedan, the Giulia, would have followed by the end of 2013 at the earliest. But none of these models seems to be on schedule. The 4C production model most likely will debut at the Detroit auto show in January, but it is unclear when it will go on sale in the United States. A large crossover or SUV might arrive in late 2014, while the timing for the Giulia is still uncertain. Marchionne's original plan called for North America to account for 85,000 of Alfa's 500,000 sales by 2014. In September 2011, the global target was lowered to 400,000 units, partly because of delays in the redesign of the Giulia sedan and of larger vehicles, and partly due to the shrinking the European market. Last year Alfa sold 132,000 vehicles globally, up 18 percent from 2010, but in the first half of 2012 sales declined 31 percent to 54,100 units. Technically, Alfa is already in the United States; it sold a few limited-edition 8C models at Maserati dealerships. Here is Alfa's current plan, subject to changes that Marchionne is expected to announce next month. Subcompact: Alfa canceled plans for a U.S.-bound five-door variant of the Europe-only three-door MiTo. The redesigned MiTo is to be a sibling of the next-generation Fiat Punto. Due to the worsening Italian and European market, Marchionne put on hold the Punto redesign project and, consequently, its Alfa derivative. 4C: The first units could be shipped to U.S. dealers sometime next year. The 4C is a baby 8C, with a lightweight body of carbon fiber-reinforced plastic and a 250-hp, 1.8-liter gasoline engine with turbocharging and direct injection. The small production coupe -- just a few thousand units a year -- most likely will use a new, Fiat-developed seven-speed dual-clutch transmission. Alfa is studying a roadster variant of the 4C coupe, the 4C Spider, with an easy-to-remove carbon fiber-reinforced plastic roof. Production plans and timing have not been announced. Giulietta: Alfa shelved plans to take the compact hatchback to North America when it is refreshed in 2014. Investments to make the Giulietta U.S.-compliant were considered too high to recover in the remaining life cycle of a model that originally launched in Europe in July 2010. The United States could get the compact when the Giulietta is redesigned near the end of the decade. A compact wagon variant was approved last year but canceled early this year as the economy worsened in Europe. Giulia: In the past 30 months, Marchionne repeatedly approved, then killed, several styling proposals for the mid-sized Giulia sedan. In the latest Alfa product plan, unveiled by Alfa Romeo CEO Harald Wester in September 2011, both the Giulia sedan and wagon are due in 2014. The Giulia sedan and wagon are scheduled to be built in the United States and exported to Europe. They will replace the slow-selling, Europe-only 159 sedan and Sportwagon models, which Alfa discontinued in May 2011. The two Giulias, which are based on Fiat's CUSW platform that debuted on the Dodge Dart, will have transverse engines and offer front-wheel drive or all-wheel drive. The two models will share their underpinnings with a redesigned Chrysler 200. The Giulias are expected to use a nine-speed automatic transmission that Chrysler will build under license from German transmission specialist ZF Friedrichshafen. Power will be supplied by 3.2- and 3.6-liter versions of Chrysler Pentastar V-6 engine equipped with Fiat's MultiAir variable valve timing. Roadster: The two-seat roadster is now due in 2015 instead of next year. In May, Fiat and Mazda said they would co-develop roadsters. Alfa will launch its model in global markets, including Europe and the United States, starting in 2015. The car will be built at Mazda's factory in Hiroshima, Japan. The Alfa model will be a variant of the redesigned rear-drive MX-5 Miata. 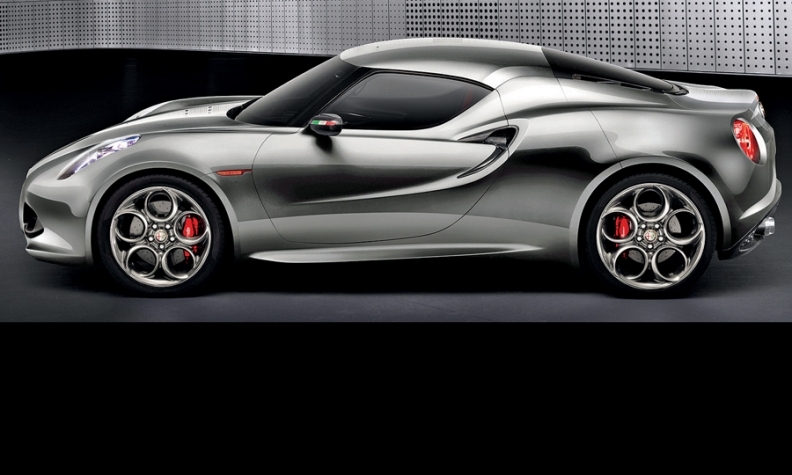 Alfa is expected to use a 200-hp version of the 1.8-liter direct-injection turbocharged engine to debut with the 4C. Compact crossover: This is another model shelved by Alfa. It originally was scheduled to go into production by year end in Fiat's Mirafiori plant in Turin. Mirafiori is scheduled to assemble, starting in late 2013, only smaller crossovers for the Fiat and Jeep brands. Mid-sized SUV: Alfa is working on a sibling to the Jeep Liberty when the Liberty is redesigned in 2013. The Alfa variant is to go on sale in 2014. According to the latest plan, it will be built alongside the redesigned Liberty by Chrysler in its Toledo, Ohio, plant. Large sedan: Alfa's plan called for a rear-wheel-drive large sedan to debut in 2014, but this model appears to have been canceled.